B.E.G. Controls offers a wide selection of momentary contact button wall switches to ft your design style, project specifications, and budget requirements. Purchasing wall switches from B.E.G. Controls not only gives you the convenience of one-stop shopping, but also ensures compatibility with your sensor or power pack. Custom engraved labeling is an available option on most wall stations. 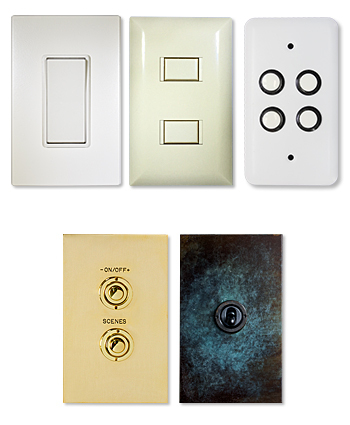 PADDLE is a value wall switch with a classic look. The PADDLE is compatible with decorative-style wall plates by others for design flexibility. Rated for line voltage or low voltage. Available in 5 colors. Wall plate not included. Custom engraved labeling not available. SLEEK is a value wall station with simple, good looks that does the job. A snap-on plastic wall plate is included for a screw-less finish. Available in 1-3 buttons and in 3 colors. Custom engraved labeling is available. Not multi-gang compatible. PETITE is a mid-level wall station with understated styling. It includes a snap-on plastic wall plate for a screw-less finish, and is compatible with decorative style wall plates by others. Available in 4 colors. Custom engraved labeling is available. MODERN is a mid-level wall station with contemporary styling. It includes a snap-on plastic wall plate for a screw-less finish, and is multi-gang compatible when used with decorative-style wall plates by others. Available in 1-3 buttons and in 2 colors. Custom engraved labeling is available. When aesthetics and exclusivity are the highest priorities, consider premium designer wall stations by FORBES & LOMAX. Available in high-grade finishes with push button or toggle style buttons. Custom engraved labeling is available. For more product information please visit www.forbesandlomax.com. Available through B.E.G. Controls.